Wouldn’t it be great if you could have your driveway and patio cleaned professionally? Nowadays, you only need to pick up the phone and contact our company. 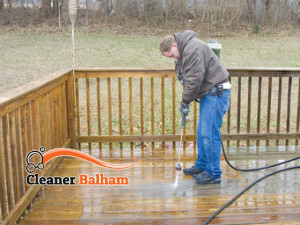 We assure you that our patio cleaning service in Balham will have a splendid effect on your patios. Our powerful equipment will get rid of any dirt or grime, such as mud, stains, gum, algae, etc. Your patio will look as clean as it was in the beginning. Don’t wait for later. Make sure to dial our contact number and get a service. We will be waiting for your call. It has to be said that the way we clean patios is very efficient because we never miss a single spot. That is, we clean everything. Our patio cleaning service in Balham SW12 is comprehensive and efficient. If you want your driveways and patio to be presentable and beautiful, our pressure cleaning service in SW12 Balham is your best bet. We tend to leave outdoor areas as clean as they could possible be. We work really hard to make this happen. We stay as long as we have to, operating our high-calibre machines and tools, working from one corner to another. We have extensive experience in this trade and we know that we can handle any cleaning job as long as it has to do with your patio. We assure you that algae, stains, dirt and debris don’t stand a chance. Especially when it comes to our powerful cleaning system, which, we are certain, is effective. We always yield stunning results. You shouldn’t worry about your patios. In case you are interested in our service, you have to get in touch with us. We suggest you either email us or give us a ring. Our office staff will handle your requests in a fast manner and get things started for you. You can expect the best results. Give it a try.